Buy One Property a Year and Retire Early? | Passive Income M.D. Home Fin Independence / Fin Freedom Buy One Property a Year and Retire Early? So I went home to see what that might look like and tried to model it out on paper. Here’s my disclaimer: this is my N=1, my one simplified example. I believe this pertains to both real estate and stock market models. However, what we do know is that simpler models are easier to apply and to take action on, mostly because you feel you can replicate it. Each property purchased is a single family home. The purchase price stays constant at $100,000 (to keep the numbers round). Each year requires a 30% initial investment ($30,000 in this case). The max # of home loans at any one time is four. According to Fannie Mae / Freddie Mac, you can possibly have up to ten residential home loans, but after four it becomes a bit more difficult to get additional loans, so decided to keep it at four. Cash flow per property is $400 a month. This number was chosen because this is very attainable, as proven by my own rental property. Cash flow = Income – Expenses. Income = rent. Expenses = Mortgage Principal + Interest + Taxes + Maintenance + Property Management + Vacancy. All the cash flow throughout the year is saved and goes back into paying down the home loans at the end of the year. Once a property is paid off, the property cash flows $800/month. That’s because there is no longer mortgage and interest to be paid. If you have the max 4 properties, the $30,000 initial investment goes towards paying down one of the loans. Referencing the Case-Shiller index, used 3.4% as the appreciation rate. Equity pay-down over time, which works significantly in your favor but can get confusing for the calculation. $30,000 invested and you have your first rental property. Congrats! Cash flow is $400 a month ($4,800/year). At year-end, this $4,800 reduces Home #1’s loan to $65,200 (= $70,000 – $4,800). $30,000 invested and you have your 2nd rental property. 2 cash-flowing properties at $400/month results in $9,600 for the year. At year-end, this $9,600 reduces Home #1’s loan to $55,600 (= $65,200 – $9,600). $30,000 invested and you have your 3rd rental property. 3 cash-flowing properties at $400/month results in $14,400 for the year. At year-end, Home #1’s loan is at $41,200 (= $55,600 – $41,200). $30,000 invested, you now have the max 4 rental properties. 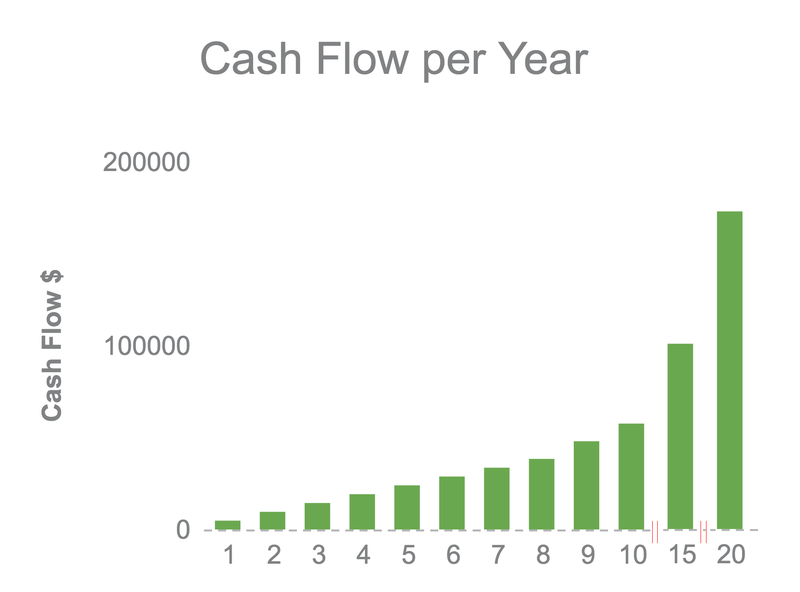 Cash flow is $19,200 per year (= $4,800 x 4). At year-end, Home #1’s loan is $22,000, the rest are still $70,000. Since you have max 4 houses, your $30,000 investment goes to paying of the rest of Home #1, and the remainder reduces Home #2’s loan to $62,000. At year-end, Home #2’s loan is $38,000. $30,000 investment buys Home #5. Cash flow is $28,800 ($800/mo for homes #1-2, $400/mo for homes #3-5). At year-end, Home #2’s loan is down to $9,200. Since you have the max 4 houses, your $30,000 investment goes to paying of the rest of the home #2, and the remainder reduces Home #3’s loan to $49,200. At year-end, home #2’s loan is $15,600. $30,000 investment buys home #6. At year-end, home #3 is paid off and remainder goes to home #4’s loan. $30,000 Investment buys home #7. At year-end, home loan #4 is paid off, and remainder goes to home #5’s loan. $30,000 Investment buys home #8. You own 8 rental properties at this point. You were very close to your goal of purchasing one a year and you didn’t need to violate the max four loans at a time rule. Four homes are completely paid off, four still have mortgages on them. Cash flow by end of year 10 is $57,600 a year ($4800 per month). If you had a $2 million portfolio at this point, and started to draw down 3%, you’d have a very similar cash flow. Again, roughly figuring out the appreciation of each home using a rate of 3.4% yields total equity in the properties around $750,000. Total investment has been $300,000. You can start seeing a snowball effect happening although it seems to just be hitting its stride by year 10. This is something most physicians could replicate. The cash flow is starting to amount to something substantial by Year 10. What would that cash flow by year 10 allow you to do? Would it cover educational expenses for your child? How many shifts would that allow you to give up? You own 12 homes, 10 of which are paid off by year-end. Cash flow is $100,800 a year ($8,400 a month). Equity in the properties is around $1.4 million. You own 19 homes (very close to one a year! ), all 19 of which are paid off by year’s end. Cash flow is $172,800 a year ($14,400 a month). Equity in the properties is around $2.8 million and growing. I think it’s worth mentioning that if you were able to amass a nest egg of $6 million dollars and you withdrew 3% a year, that would put you somewhere in the range of $180,000 your first year. At this point, I think it’s pretty safe to say that working is relatively optional and total retirement is a possibility. That’s some serious passive income! Imagine starting this when you’re in your early to mid 30’s when you first became an attending physician. So Did I Follow This Advice? Next articleWhat Happened to Doctors and Golf? Just wanted to say “Thanks” for this article. I come back to it every couple of months to read through it again and get a little inspired every time, although not enough yet to take the actual plunge into real estate investing. What scares me is the research – how do I know the right house/multi-family unit to buy, what to rent it for, what to expect of expenses, etc., etc. Everyone says, “Do your research,” but where to start? I’ve seen your book recommendations, but it all still feels a little daunting. You’re welcome. Yes, it can be daunting, especially your first one. You can read all you want, but it’ll never guarantee you the perfect investment. You’ll also never learn as much as when you actually jump in. People can easily get stuck in “analysis paralysis” and never pull the trigger on anything. I’ve found a good transition is by starting either in crowdfunding or by buying a rental property through a turnkey operator. That way you have a helping hand along the way. Yes, you might pay more in fees, but I think it’s well worth it to have someone to rely upon for day to day operations and issues. It’s also easier on the schedule for a busy doc. Thank you so much for the great article! I am still a 2nd year derm resident but can’t wait to be an attending/be able to moonlight during 3rd year so I will be able to have more $$ towards investing/retirement (25% of $65K is something but not a lot). 1) Do you think that with the taxes/deprecation/maintenance the overall returns of investing in a home at around year 10 or so is better than just in the stock market with diversified low fee ETFs? 2) Do you currently do the management of the properties yourself or use turnkey operators to decrease time/headaches? If you manage them yourself does it take a lot of your time each month? 4) Are there any great books/articles that you would recommend for learning more about real estate? 1) Lots of assumptions here and it depends on a lot of factors like market timing, but in short – yes. 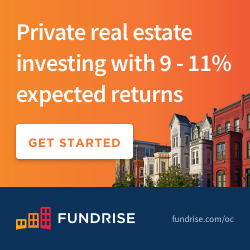 In owning investment real estate, average returns of 10-20%+ are reasonable, factoring in all the ways you make money in real estate – cash flow, appreciation, mortgage pay down, tax benefits, use of leverage. However, does require more work. 2) I manage some and I have property managers for the others. I’ve bought out-of-state with and without turnkey operators. Turnkey does make it easier but it doesn’t relieve you of the duty of doing your own diligence. Whether I use management depends on how much work I think it’ll take. General principle – I want all my properties managed by someone else freeing me up to make the bigger decisions and focus on optimizing my investments & find new places to invest. 3) I’ve invested in both – 10-20 min drive from my house as well as investment properties in different states only accessible by a 4-5 hr flight. I can’t find $100k properties near me as well, but I was able to buy 6 units for $800k which comes out to $133k a unit. I enjoyed reading this example of how one can retire with this method. We are on our path to financial independence with real estate playing a major role. Our goal is to have 20 rentals within the next 10 years and we have 3 so far. Let’s hope the 10 loans per person don’t change, because we are planning to leverage each one of them. But I can see how this example can help us get to our goal of $x per month without taking on too much leverage. That’s a great goal to have. Getting the first couple under your belt is the hardest, and you’ve already passed that. Congrats! Are you focusing on single family homes only? Thank you! Yes, we’re focusing on single family homes only at the moment. I think once we get to the point of being “accredited” investors. We may look into investing in apartment syndications. Or we can 1031 exchange our SFHs into multi units. I would love to get some deals on 2-4 unit properties but that’s hard to come by. Our main focus is turnkey investing because we just don’t have the time to find deals. I’ve bought both with and without turnkey operators. Unfortunately these properties don’t exist in my backyard so I need to look out of state. https://passiveincomemd.com/how-i-bought-an-out-of-state-investment-property-from-my-call-room/. So it depends on where you’re looking and ultimately how much you’re willing to put as a down payment. Whoever is helping you buy should help you with this determination. I definitely do not self-manage from afar. You could try to save the couple hundred dollars a month, but I believe your time is best spent elsewhere than getting calls for clogged toilets. That’s a bold goal to have to own 20 rentals. I am just getting started and looking forward to acquiring my first property in the next couple of quarters. How does one find good turnkey operators? Are there any good recommendations or any good resources for it? Thank you. It’s definitely doable. The first few are the hardest and then it’s like a snowball. Turnkey is just one way to go, but personally I don’t feel it’s a bad first step. You have to go off reputation and word of mouth, and ideally the experience of someone you trust. I’ve only used Homeunion and had a good experience, but I’ve heard good things about Roofstock and Memphis Invest as well. I’ll try to come up with some good content for you. It definitely gives more courage to hear from people who have already done it or have already started on the path. And yeah, like you have mentioned earlier, lately been thinking Turnkey might be a good way to start off on this journey and learn along the way to become more self reliant. Truly appreciate your response and look forward to any more content on this. Thank you. Hi Ruth! Owning 20 rentals is a feasible goal. Like PIMD said, the first few are the hardest and it gets easier from there. I think the fear goes away and the amount of knowledge that’s obtained after the first few leads you to act quicker and snowball into more properties easier. For turnkey operators, it is definitely a lot of word of mouth and reputation as mentioned above. My go to resource for learning more about turnkey was Get Rich Education Podcast with Keith Weinhold. I personally invest with Mid South Home Buyers out of Memphis and I love their service from A to Z, they’re definitely top notch. There are so many ways to invest in real estate, and has just been the easiest. We would love to get into other areas of investing such as flipping or buy and hold, but just don’t have the time or energy to do all of that at this point in our lives. And when we become accredited then onto bigger deals hopefully. Good luck with your first purchase! just one or two breakdown of air conditioners, or 2 or 3+ months of vacancy will screw up your cash flow plan. where your doctors find time to deal with tenants? it’s never a Nine to Five workday for doctors. Well, an important part of investing is setting up a small maintenance reserve. Yes, long term vacancy will screw it up but I think’s safe to assume that rent should increase with time. Not a perfect model, but should at least get you thinking. With management, the doctor doesn’t need to deal with tenant issues. I have an out of state rental and I’ve only been notified for move out and move in. Great article. Keep in mind also that if you can learn to buy properties creatively you can often eliminate the need for a bank allowing you to be less restricted in buying rentals. So I read the article in the link you referenced for Sam and with an $80K mortgage receiving $1,100 in rent and being professionally managed, I can only estimate you are receiving about $190 per month cash flow and that is with some very generous property tax/insurance assumptions ($1,800 per year combined). You’d have to have 0 vacancies and $0 repairs/capex for the entire life of the investment to even sniff $400 per month. What am I missing here? I want it to be true, but I think Sam’s question above is valid. Hi, thanks for reading. You’re absolutely right. I’ve had a couple things work in my favor. Longer term tenants without turnover and the home is relatively new requiring very little maintenance. That comes with purchasing a newer single family home. Being my first out of state property, I went for this profile. I understand it’s a pretty rosy picture and honestly, I don’t expect this with every property I purchase. And it may change. I didn’t factor in a CapEx & vacancy reserve which if you’re being totally conservative, you should factor in. However, I anticipate increased rents as well in the future which should help mitigate some of that. All for what a measly $300 of passive cashflow. You are going to need a gazillion of these SFHs. I have 10 sfhs and I have 1-2 evictions a year. Imagine what that you be like with 30… well I know you would have 3-6 evictions. That’s a pretty high eviction rate! Great post and a very compelling idea. Cash flow projections are fairly optimistic, but even at lower numbers it’s still feasible over a longer time horizon, maybe 15 years and with a little more investment of personal money beyond the 30k per year for vacancies and major repairs. Either way this model eventually gets you where you want to be – with cash flow from real estate and an opportunity to retire early, and most people who read this blog probably have at least 10-15 or even 20 years before they reach 65-70 years old. Also, rent increases could ostensibly remedy a more pessimistic cash flow projection. I wish I could say this idea is my own, but it isn’t. It was given to me by Dr. C. However, I’ve also since heard that there’s a good book on this exact subject. You get it though, there’s a real and achievable pathway to cash flow and retirement goals, you just have to break it down to see how it might work. That’s where I think it can be dangerous to present this type of scenario for new investors. Sure these deals happen from time to time, but not on a scale where you can crank them out like clockwork for a deal per year. BiggerPockets has the same issue with their “7 Years to 7 Figures” presentation. It’s all Excel sheet math that looks fantastic, but it is totally unrealistic. Readers don’t critically think and actually look at the numbers presented, which if done, reveal absurd 20% cap rates and 50% cash on cash returns and paints a picture that these things are just laying around for one to pick up. You mention not having as much tenant turnover and maintenance because it is a newer single family home. Cool, but where do find newer single family homes for $100K? I am in a very low cost of living city in the Midwest and you’re only getting $100K SFH’s in C areas that are 50 years old. And factoring in repairs/CapEx reserves is not “being totally conservative”. Those are real world costs that get glossed over a lot of the time. Thanks for your input, definitely valid. I made a lot of assumptions but I made them in both directions meaning that I might have minimized CapEx but I also didn’t take into account increasing rents and all of the other ways you make money in real estate including appreciation, tax benefits, etc. Certain markets will underperform this model, but there will be others that exceed these expectations. I do appreciate your sentiment so hopefully it’ll make you feel better that it’s meant to be more of a thought exercise. I know people who have started doing this exact thing and have done wildly better than these projections because let’s face it, once you start investing in real estate, most people end up scaling up a bit. 1. Do you try to make sure these are all close to where you live for simplicity? 2. it seems like it could end up being a huge headache to manage all these properties. Do you hire a property manager? Keep a massive emergency fund just for the houses? Thanks! Are you willing to share your spreadsheet? I have been trying to recreate it with embedded formulas so that I can adjust the loan amounts and it will update automatically. Was wondering if you already have a working version. I would love to see this spreadsheet, as well. I’ve said it before, but this is one of those articles I have saved that I routinely come back to. In real life, for the majority (maybe the author is just really good), that 100k property is going to cash flow 400$ a year. As it will only command a 1k rent, not 1420 which is imputed from his 4800$ figure. You can get that kind of high multiple but it will be in section 8 housing, which then gets you good in the other line items such as maintenance and vacancy. I suspect the author either invested during the right time, did section 8 housing and hasnt had to renovate them yet, or isnt taking all costs into account when reporting his profit (such as capex). If any of you find these properties that sell for, all in after rehab, 100k, in an A hood, with 1420 rent consistently and think Im just hatin, Let me know. We will do lunch. Ill pay you 10k for each property you bring me and I close on. Hi, the cash flow is net of principal, interest, taxes. Sorry, my assumption that it was clear, but I can look back to see how to make it more clear, thanks for reading. Let me know if that makes sense. I think what s/he meant is, with that minimum monthly payment, there wont be any loans that stay $70k and you can have all the cash flow put into the same loan, which will significantly slow down this procedure you described. Hi Doc…love the article…Please make your your spreadsheet available…I wish to play around with the numbers relative to our south african market. Thanks for sharing this interesting plan of structured SFH investing. I just wanted to point out that the year 4 column in your spreadsheet may have an error: Shouldn’t “Home Loan 2 at Year End” be still at $70,000? It’s a simple model where cash flow is equivalent to income – expenses. Expenses include mortgage principal, taxes, insurance, maintenance, prop. management, etc. I’m jumping to a round cash flow number. Let me know if that makes sense. -In year 7, you’ll actually have 5 mortgages, not 4, as you’ve only paid off Loan #1. 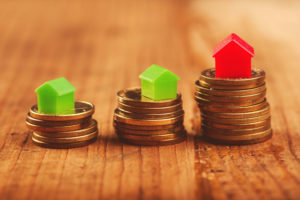 -Once you get to 4-5 properties, that’s a lot to self manage – especially if you’re buying houses that throw off that much cash as they’re usually in not-great areas. -It’s highly unlikely that you’ll be able to buy the same type of house 8 years in a row at the same cost with the same margin. -As Steven mentioned above, to get $1480 a year for a $100,000 house – that’s basically not going to happen in any area with average or better appreciation. -Zero vacancy rate would be nice, but is a pipe dream. @ Passiveincomemd – thanks for this article! While these types of projections always get complicated, the overall trajectory is an inspiring visual. I hope to follow this model to increase cash flow in our portfolio and whittle down on our financial independence number. It’ll also be great for reducing overall tax burden. @ Lena – I’m in wait list purgatory with Mid South myself, so it’s great to hear that the wait may be worth it after all. I’ll stay patient.